17 Sources of Food Containing Vitamin B6 (pyridoxine) Most High. The function of vitamin B6 or pyridoxine, vitamin B5 and to help in the conversion of carbohydrates and proteins into energy, vitamin B6 also plays a role in the formation of red blood cells and antibodies. Vitamin B6 in high doses is used to repair damage caused by irradiation, neuritis following isoniazid therapy or sikloserin. Sources of vitamin B6 is very much present in the food we eat everyday. Therefore, the case of vitamin B6 deficiency is rare in humans. The liver is the organ parts of animals such as cows, goats, deer, sheep that can be consumed by humans. Liver is quite popular because it is a natural food source of vitamin. One is vitamin B6. 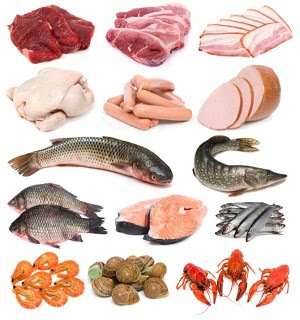 But there are also side effects of meat consumption careful because many contain cholesterol. Preparations for the heart itself many modern processed foods like sausages. Liver meat turkey contains 1.04 mcg of vitamin B6 in a dosage of 100 grams. Meat beef liver contains 1.03 mcg of vitamin B6 in a dosage of 100 grams. Fish also contains vitamin B6. Fish contains vitamin B6 include tuna, cod, salmon. The content of vitamin B6 levels in tuna with 4 ounces of tuna fish was 1.18 mcg. The content of vitamin B6 levels in salmon with 100 grams is 0.94 mcg but for levels 3 ounce contains 0.8 mcg of vitamin B6. The content of vitamin B6 for cod grading 100 grams is 0.462 mcg but for levels 3 ounces contained 0.39 mcg of vitamin B6. These fish are mostly found in Indonesia, like in the modern supermarket or mall. Or in a more practical like canned sardines. Spinach is a vegetable that is widely grown in Indonesia. Is one of the favorite vegetables enough to be consumed daily. Spinach contains vitamin B6 0.44 mcg every one cup of spinach. Spinach is beneficial in fighting cancer, anti-inflammatory source, reducing the risk of cardiovascular disease, lowers high blood pressure, and able to prevent anemia. The content of vitamin B6 in potatoes are baked or cooked every single potato contains 0.54 mcg vitamin B6. Potatoes are very popular in the country of Indonesia. Especially when fast food business presence in Indonesia, particularly potato fries snack choice than to use the main vegetable food supplement. One cup of cooked collards contains vitamin B6 for as much as 0.14 mcg. Sawi many benefits. Such as preventing osteoporosis, mustard greens also contain niacin to reduce atherosclerosis to prevent heart attacks. It also controls the levels of cholesterol in the body. There are two types of mustard greens mustard greens and chicory. For vitamin B6 at a dose of 1 cup radishes cooked was 0.26 mcg. Radish beneficial to reduce fat in the body. With high fiber was then used as a complement turnips suitable weight loss program. Radish also prevents indigestion, prevents diabetes to prevent cancer. One cup of cauliflower contains 0.2 mcg of vitamin B6. Cauliflower is very well taken for pregnant women. Because a lot of vitamin content and a lot of fiber to help grow and develop into optimal fetal birth later. Thus prevent children developing birth defects. For one cup of broccoli contains 0.16 mcg vitamin B6. Broccoli contains a lot of benefits. Among the benefits, among others, can prevent constipation which often occurs in children. Because broccoli maintain intestinal organs in the abdomen. There was also broccoli can lower cholesterol in the body. For vitamin B6 at doses of 0.27 mcg one cup contains. Paprika is a vegetable in the form of a bell-shaped fruit. It has a flavor that is similar, though not sepedas chili peppers. Paprika is widely used in food recipes. The benefits of peppers is an antioxidant and immune-boosting, as an antibacterial, normalize blood pressure and improve circulation. For one cup of asparagus contains 0.12 mcg vitamin B6. Asparagus is now very widely used for recipes. As made asparagus soup, scrambled asparagus, crab asparagus soup, asparagus sauteed chicken, shrimp sauteed asparagus, and many more. Asaparagus itself useful for anticancer, antioxidant, anti-aging, as well as a natural diuretic ..
Every single banana contains 0.43 mcg vitamin B6. Banana is a fruit that grow in Indonesia. Because that's where the banana is a fruit that grows in tropical climates. So it's not hard to meet the needs of vitamin B6 from bananas were encountered this. The content of vitamin B6 in avocado one cup is 0.38 mcg. Avocados are benefits such as prevention of prostate cancer. Then avoid cancer of the mouth, avoiding the threat of breast cancer, maintaining healthy eyes. Then beneficial for heart health and stroke prevention. One cup of tomato contains 0.14 mcg vitamin B6. Benefits of tomatoes reduces the risk of cancer is prostate cancer. Then the body prevent heart disease. Immunity increases well after eating a tomato. Melon fruit also contains vitamin B6. Melon is a fruit that is green with green flesh too. There is also a yellow flesh. Including melon fruits that contain lots of vitamins and are also rich in water. Watermelon is also a fruit that contains vitamin B6. Large watermelon shaped like a melon. With green skin but has a red pulp with many seeds. The difference with a fleshy melons hard, soft fleshy watermelon. Thus including fruit also contains a lot of water. Nuts also contain vitamin B6. Such as soybeans, peas, and green beans. While there are also red beans are a source of food legumes are pretty good for the body because it contains a lot of vitamin B6. In the green beans with a cup containing levels of vitamin B6 0.14 mcg. By consuming at least one cup or bowl of nuts, you can meet the daily requirement of vitamin B6. Grains which include vitamin B6 is good enough sunflower seeds and sesame seeds. The content of vitamin B6 in sunflower seeds with a quarter cup dose was 0.47 mcg. The content of vitamin B6 in sesame seeds with a dose of 100 grams is 0.8 mcg. Sunflower seeds themselves are often referred to in Indonesia as watermelon seeds. Typical snack foods that taste quite sweet and savory. While the sesame seeds are widely used to take oil. Seeds can also be used in the preparation of foods such as dumplings. It can even be a pasta-making materials. More useful again sesame oil can be used as a pain reliever such as alternative medicine.